At Veligandu we have a myriad of inspiring leisurely ocean experiences that will make your holiday that much richer. Set out on a sunset cruise, try line fishing or visit a local island to discover famous Maldives’ tourist spots aboard a traditional Dhoni. These are just a few recreational options available. Fill your days with experiences and create everlasting memories. Veligandu Island Resort & Spa offers a wide range of full day and half day excursions at sea to suit every preference. Cancellation and No Show Policy: a 50% charge will apply for booked excursions cancelled with less than 6 hours prior notice. No shows will be charged full price. Kindly note that all excursions depend on weather conditions and are subject to change without prior notice. Rates include 12% GST and are subject to change. 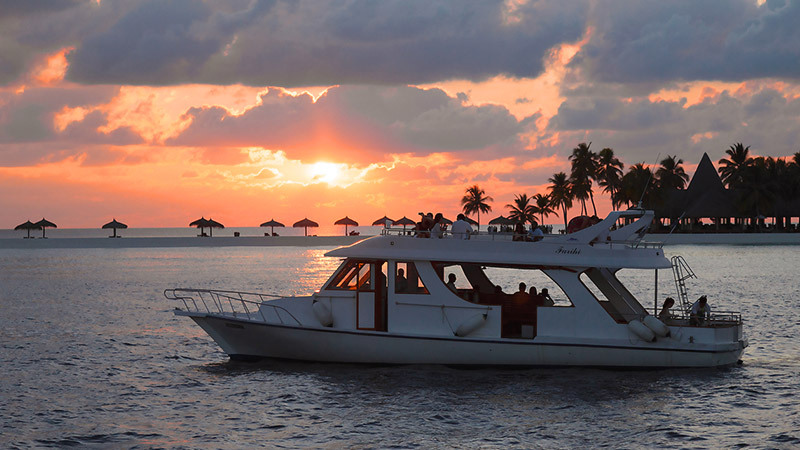 Sail at sunset with your special someone aboard a private Dhoni and toast to your love with a glass of special punch. Enjoy a late afternoon Dhoni cruise, photograph the tropical sunset and, if lucky, witness playful dolphins! Spend quality time with your loved one overlooking the starlit sky, while enjoying non-alcoholic bubbly and canapés. Don't miss the chance of a lifetime to swim in the company of gentle giants, whale sharks. Feel the thrill of casting fishing in the Maldives aboard a charted Dhoni boat. Coffee, pastry and soft drinks included. Set out on a fun half or full day charter Big Game Fishing adventure at sea, including coffee, soft drinks, and water. Catch your dinner the Maldivian way with handline, hook, sinker and bait either at dusk or after nightfall. Spend a wonderful day sunbathing and snorkelling at Madivaru and Finolhu Islands, BBQ lunch with soft drinks included. Let your wanderlust get the better of you with a trip to the local island of Rasdhoo. Wander the islands of the Maldives with a sightseeing trip to the neighbouring Kuramathi Island Resort. Nourish your curiosity with a visit to a local island, a resort island, and a picnic island.